When buying platinum rings for men online, there are a few essential concepts to learn. First and foremost, congratulations! You have selected the best metal to symbolize your commitment and love. This is the wisest decision you have made about your wedding [besides choosing your spouse!] - Here are a few things to keep in mind about this noble metal. Before purchasing a ring, you should understand the special characteristics of the metal. First, platinum is a very rare and precious metal, much rarer than gold. In fact, platinum occurs at only 50 parts per billion on Earth. Platinum is dense and boasts a brilliant white luster. All of the rings we sell are alloyed with small amounts of other metals. Here are a few reasons why platinum is often combined with other metals. Platinum is one of the more malleable, or softer, of the metal types used in jewelry. When it is alloyed with a stiffer metal, such as ruthenium or cobalt, it will improve the longevity of the platinum. When shopping for a ring, you should always check to see the metal fineness or purity. Alloyed rings have a small number located on the inner part of the band. The number, or fineness mark, indicates the platinum to alloy ratio. For example, a ring with a hallmark of PT950 or 950PT means the ring is composed of 95% platinum and 5% other metals. The higher the platinum content, the higher the price. The purity of the ring may be a deciding factor for many shoppers and can be a good way to narrow things down when looking for the best deal. Contrary to what you might think, pure platinum rings are not desirable. They are more susceptible to scratches, dents and bending. These rings will also be more costly. 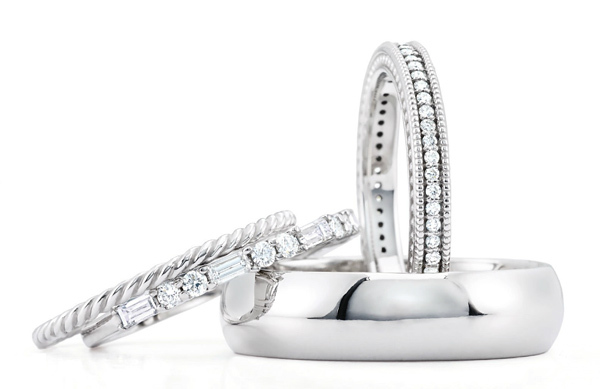 Wedding rings come in a variety of styles. Gone are the days of plain bands. 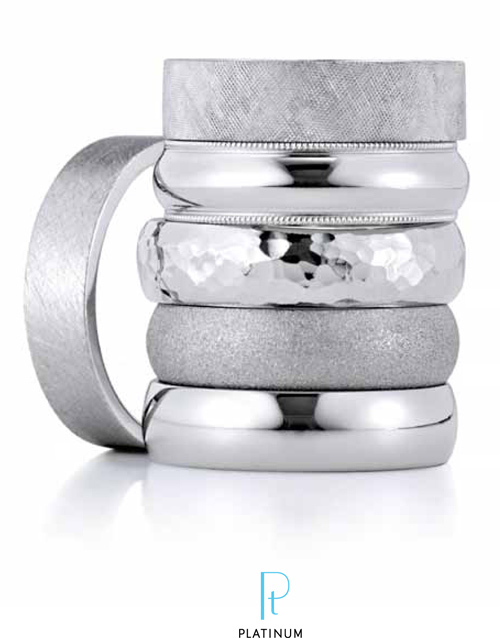 Today's platinum wedding band comes in such designs as beveled, flat, domed, milgrain, and more. In fact, wedding rings can feature diamonds, gemstones, and hand carved inlays. These beautiful embellishments can add a touch of beauty and elegance to any commitment. When selecting rings for your wedding, Joy Jewelers offers a wide array of options. Find the perfect band for your love story with our high-quality platinum rings in various styles. Platinum is naturally white all the way through. Unlike white gold, platinum never requires plating. But please note, all platinum jewelry will develop a patina over time. This patina is the natural result of the ring's exposure to air. Many people consider the patina to be a beautiful tribute to the passage of time and the growth of their relationship with their loved ones. But if you don't like the patina, any jeweler can quicky polish the surface of your ring to restore it to its original bright white luster.